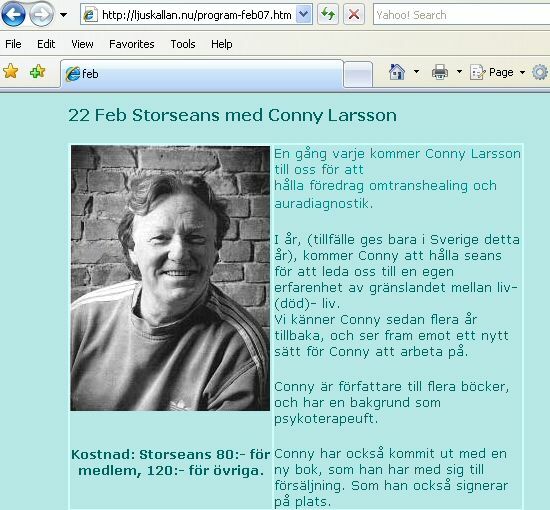 When Did Conny Larsson Become Maharishi Mahesh Yogi’s Private Secretary? 1971 or 1973? When Did Conny Larsson Leave Maharishi Mahesh Yogi? 1975 or 1976? Why Did Conny Larsson Leave Maharishi Mahesh Yogi? Did Dr. Hislop Write Maharishi In 1973? Conny’s account is directly contradicted by John Hislop himself in his book “My Baba and I” (in which Hislop said he left Maharishi in 1968, five years prior to Conny’s account). Conny Larsson Was Maharishi’s Secretary For How Long? As with Sathya Sai Baba, Conny Larsson’s stories about Maharishi Mahesh Yogi have changed, progressing from fairly innocuous claims to highly defamatory ones. Why? 1965-1968 Conny Larsson is an educated actor at the Governmental Actingschool (Statens Scenskola) in Malmo-Sweden. 1968-1975 He worked periodically as an comedian actor at Malmo Stadstheater. 1969- Educated to teacher in meditation in Rishikesh-Himalya-India. 1970- Educated to teacher in SCI (Science of Creative Intelligence in Livigno-Italy). 1973- Private secretary to Maharishi Mahesh Yogi founder of the TM organisation. 1980- Founded and runned Karnan Home-Institute as a director and cheif therapist for drug addicts and severe criminals. 1998- Founded in Sweden, Polen and Germany – the Vedic Mantra Meditation school. 1998- 2006 Holding International courses and educating teachers in Vedic Mantra Meditation. 2005- Published the book ‘Bakom Clownens Maska'(Behind the Mask of the Clown). The comment above is wholly contradictory. I guess the alleged “open-minded discussions” are not so open-minded afterall. Anyone with “secterist views” is not allowed to participate in Conny Larsson’s “open minded discussions” and they are censored and prohibited from expressing their beliefs and experiences (sounds very cultish if you ask me). “International yoga vacation with Conny Larsson in the Sea Palace in Gaski near SarbinowoThe Sea Palace is located ca 900 meters from the sea in a beautiful historical park of 6.5 ha, in a picturesque village of Gaski between Koeobrzeg and Koszalin.The location of the Sea Palace ensures a pleasant and tranquil retreat in a quiet setting. In the vicinity of the Palace there are numerous sports facilities such as volleyball and basketball courts, tennis court and children’s playground. A guarded car park is also available. For an additional small charge the Palace offers hydromassage, magnotherapy, inhalation and various types of massage.Vacation period I: 29 June – 07 July – 8 days. Vacation period II: 07 July – 14 July – 8 days. The number of single and double rooms is limited, and they are allocated on a first in first served basis. There is a bathroom and toilet in each room as well as TV and SAT equipment. The advance payment will not be re-funded upon cancellations. A modernly equipped kitchen ensures tasty and wholesome home made meals, choice of normal and vegetarian meals. Light breakfast and two larger meals a day are planned. We start with dinner on the arrival day at 6 p.m. 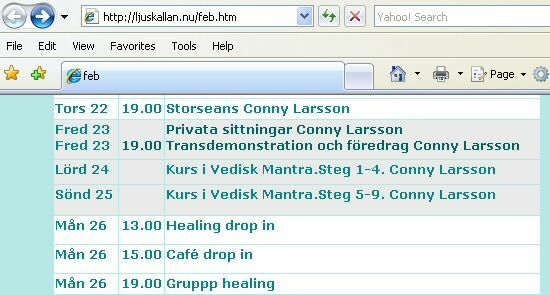 Morning and afernoon hatha yoga classes will start and finish with meditation sesions with Conny Larsson. In the spare time you can rest in the park, visit local historical sites, sun bathe on the beach, and in the evening – listen to lectures, discuss and sing mantras with Conny Larsson. 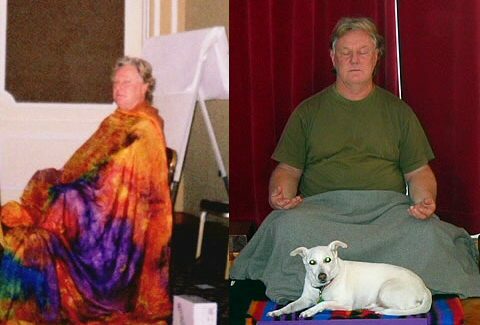 Conny Larsson studied under Maharishi Mahesh Yogi and Bhagavan Sri Sathya Sai Baba and later turned on them and accused them both of sexual improprities. So what does Conny Larsson do? He sets himself up as a Meditation Teacher (i.e., “Guru”), a Vedic Mantra Initiator (he gives mantras to his “students” and instructs them how to use them), becomes a Psychic Healer (in which he touches women in visually inappropriate ways), lectures on spirituality, conducts seminars and teaches “Master Classes”. Conny Larsson has succumbed to the very same Guru-affliction he likes to trash and bash with others. Furthermore, Conny Larsson preaches “open-mindedness” but pubicly and bluntly censors those holding sectarian views. What’s next in this Anti-Sai three-ring circus?